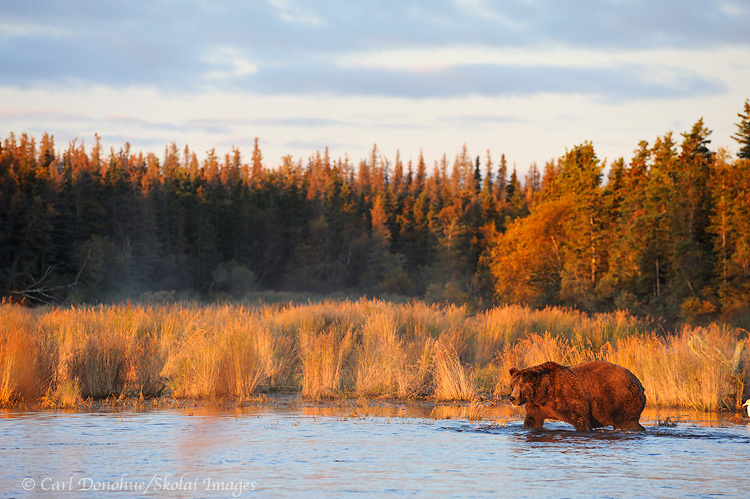 A brown bear patrols the river’s edge at dawn, searching for spawning Sockeye salmon. Brown bear (Ursus arctos), Katmai National Park and Preserve, Alaska. Please click on the image above to view a larger version of this photo. For regular readers here, you might well know of the photo tours and guiding I do with Expeditions Alaska. I’ve just now set up a page to compliment those photo tours here on Skolai Images, and you can be the first to visit by clicking here: Alaska Photo Tours. I’m currently booking 3 photo tours: the ever popular grizzly bears in the fall tour (2×1 week tours), both of which are almost full for 2012. I’m also booking 2 Alaska aurora borealis photo tours for winter/spring in 2012; March and April. And the Skolai Pass Alaska landscapes backcountry tour is a great summertime trip; July and August seem to be the popular dates for that trip. You can find all the info you might want, and links and pictures, over on the new Alaska Photo Tours page. Give me a call or drop me an email if you’re interested. Thanks so much. This entry was posted in Adventures, Alaska, Katmai National Park, Photo Tours, Photography on December 2, 2011 by Carl D.